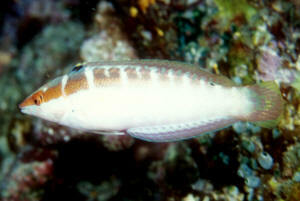 Many fish species will test, eat Ophiuroids. last night and during the incident lost the best part of three legs and the ends of two legs, he had also gained a substantial cut from the top of his body round and down to underneath, it has not touched his mouth but his orange insides are on view, he is still moving around this morning and waving for food but I’m worried he won’t survive for long, is there anything I can do to help or should I let nature take its course? I have removed the crab from the tank and I intend to take him bk to the local fish shop as he has over grown my tank anyway. There are also 3 long pieces of the star fishes legs in the tank, should I remove them or will they grow into other stars lol. Thank you for your quick response, it was much appreciated. I’ve had another look at the brittle and it seems that the hermit had actually ripped a whole leg off, I can’t find any bits of leg with a part of the disk still attached just a few bits of leg floating around, I’ll remove them as suggested thank you. As he has had a leg removed and part of his body along with it do you think there is any possibility of him surviving? I’m concerned about moving him to the sump, There seems to be silt etc on the sump floor, will this irritate him? If he does recover, do you think his cut will heal up and will he just be one leg down or will could he have an opening wound forever or could his leg grow back? Sorry to bombard you with these questions but I’ve not seen anything like this before and my LFS wasn’t that helpful!! I have attached the pictures properly this time!! Hope your able to open these ok? I have had a giant ( arm span 12-14") gold/green brittle star doing well for years in the sump ( after too many new fish in DT kept disappearing). In the last 1-2 weeks he has lost most of the length of his arms which are now only stubs. He has been fed part of a uncooked cocktail shrimp every 4-7 days for years and was doing great. All my measured tank parameters ( spg, dKH, Ca, nitrates are d/w with no other changes in system and other tank inhab.s - fish, corals are doing fine. Any ideas?? 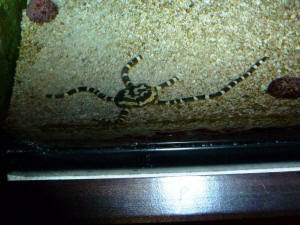 We just bought a serpent starfish last night. We are new to Saltwater tanks. We did not do the drip acclimation process as I knew nothing about it so that may be the problem. When I released it into the tank, it wandered across the tank. When we checked on it this morning it was in the same position it was in last night so we gave it a nudge with the fish net and it is stiff as a rock. Is this normal? Or is it dead? I have tried to research it and some websites say they get stiff as a defense mechanism but to stay in the same exact position for so many hours? Help! 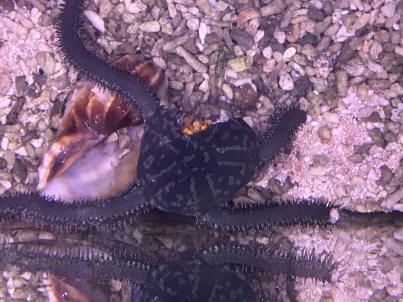 I bought a brittle star two days ago. I noticed yesterday that he had a red spot between two of his legs. Today, the spot seems larger and there is also another on the other side of his body. I couldn't find any information about this. What's going on? Parasite? A wound/infection? Expelling waste? What should I do with the other creatures (snails, shrimps, crabs, Cuke) that I have in quarantine with him, which I don't think will survive long in quarantine without a live tank to scavenge from? He's curled up in the corner now and I don't want to touch him, but hopefully you can get an idea here. I was hoping to get some help. I have had this starfish for a couple years and heÂ¹s done fine the whole time (to my knowledge). Tonight, I noticed that 4 of his 5 legs are damaged (missing a large portion of 3 of the legs!) Please see attached photo. Will this poor guy recover? 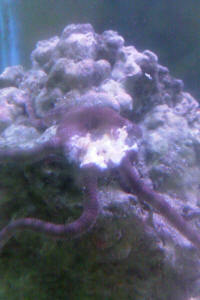 So as the title says i <I> have a Brittle Star that is crumbling. I noticed a few days ago that he was struggling to get off his back and when i <I> came home from work today i <I> looked at him and i <I give up.> noticed that his legs were falling off in small segments, one to two cm at a time. Since then i have moved him to my "hospital tank" which is a balanced 25 gallon tank that has a few shrimp and hermit crabs in it, the star is in a small covered dish inside that has holes poked into the top so the shrimp can't get to him. I checked my water in my tank and everything was normal except for my nitrites which were very high (approx. 1.0mg/l). Since then i purchased Prime for a "quick fix" which has brought the levels down to approx. .5 mg/l, and some macro algae for a long term solution. Could this be caused by the high nitrites? Thanks again Bob. 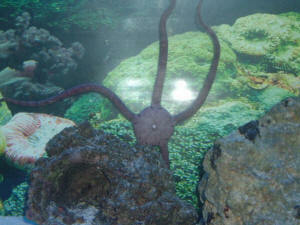 More problems keep on coming, our brittle star is now wasting away. :( We have had him close to 2 years if not more, and I'm hoping you can shed some light on him. Last night, before I hit the sack, I was checking things out and noticed that he was out of his hole in a rock. Been his home for about 6-8months. He was circling the rock, I watched him climb around it a few times and caught pictures of him as well. I mentioned to my husband that he had white dimples where his legs meet his body. Today, while checking on everything in the tank. I see him again, he has his legs all curled up to him and he has bigger white spots! So big that I swear I can see inside his body. My heart is breaking for all of my tank inhabitants that something is wrong and I just don't know what it is. My brittle starfish is the hero of my tank and has been with me for nearly a year now. He was fine this morning but when I arrived home today there was a large yellow hole in his body, I'm not sure if a crab attacked him or he ripped himself open on a rock. There is nothing new in the tank so I'm surprised if someone else attached him, any ideas, could he die from this? I have attached a picture so that you can see what I mean. Thanks for the direction Bob, he looks worse today so I think my little hero is a 'goner'. hoping that a cleaning was what he needed and PraziPro through the advise of my petstore. I shut off the protein skimmer and removed the carbon from my filter during treatment today is day three and the goby dies this morning. Now too <to> my question, last night my serpent star came out from hiding under the live rock climbed up my heater and onto the protein skimmer and is hiding and hanging out up there. Is this normal? I thought that they didn't like to come out during the day. Should I be concerned? <Yes, I would not use Praziquantel with invertebrates present. This medication is sometimes used to remove some species of invertebrate pests, especially worms, and I do not believe you consider your Red Serpent Star a pest. When can I put the carbon back in my filter? Should I continue the PraziPro treatment? a few smaller hermit crabs, a bunch of snails, and a brittle star. Everything in my tank has been fine. I check the water balance regularly. I haven't done a water change in about 6 months because every time I checked the levels were great. me to dechlorinate and it says that it will lower the nitrates/trites). which I do not have because when I bought my system they told me I didn't need one. So, where I move my little lady to? Is there anything I can do for her? How can I fix my tank? And, why did it go crazy like that? I read that I can add iodine to the tank, can I buy that at a LFS? Please, advise. Thank you very much! My tank has been up and running for three years. During that time I moved about a year ago and have never suffered a livestock loss. Today I notice what I thought was a huge worm crawling across my sand bed. 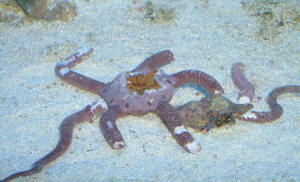 Upon closer inspection it was a brittle star arm, just out for a walk without its usual owner. So I dug around in the tank and found the rest of the serpent star, hiding under a rock. He has what looks like a very grievous wound down to what appears to be a "bone" in the central disc. It almost appears as if his arm was ripped off his body. There's never been an issue in the tank, and I'm not sure why after 3 years his health would suddenly decline like this. My first question is what are the chances for his recovery? After I released him back into the tank he moved back under the rock rapidly, so the loss of the arm hasn't effected his locomotion, however is does look hideous. And my 2nd question is, What should I do with the arm that has gone walkabout. Do I take it out before it "dies" or is it on it's way to making a new starfish? and read the cached views. NEED HELP ASAP!!! We were beginning to do the routine cleaning and my oldest son didn't see the little guy (Brittle starfish) as we were cleaning walls - he was hiding in crevice between glass wall and live rock. Unfortunately, my son nipped him good with the scrub brush and appears to have severed an entire leg off from the body disc area. The dismembered leg crawled off and the remaining part stayed lying under the rocks. I have read various stories on you site about the regenerative properties (some quite remarkable). I don't know how long I should watch or if this is a case of no return or if he will heal. How do I know all hope is lost without contaminating my tank? All levels are good. We stopped the cleaning process for now. <Perhaps feeling desperate, but no need. All will likely be well in time. Our 125 gal. tank is three years old. Our red brittle star ( Grim Reaper) was one of the first to join our tank and was quite tiny when it arrived ( 1 1/2 inches across) It grew by leaps and bounds , kept its red color and was spectacular until the last 6 months or so when it has begun to not only shrink in size but bleach out on its body. The arms are now green, but the center body is white with just a few bits of orange. I didn't find much in your Q and A concerning bleaching out. He is still active, eats heartily, but looks as if he is on death's door. What should we try? urchin. We feed the brittle star silver fish weekly, the tank Mysis shrimp a few times a week and have a timed feeder for flaked food ( 2x a day). Water changes occur 1/month (10% ). and our brittle star has been in distress for quite a while. Recently we've started supplementing our tank with iron for the corals ( 2-3 TBSP weekly) . we have 6 thriving soft corals and one hard coral that is doing well since the regular doses of iron ( attribute it to this, anyway). We've been using iodine regularly as a supplement and also use Kalkwasser mix for killing Aiptasia, but have been doing this all along with no problems previously). say cut back the hours to limit algae growth.) Q: could our very efficient skimmer be depriving the star from nourishment? My name is Tony and I have a question. I have a 92 gallon corner tank with about 60 lbs of live rock. I have a wet dry sump system underneath. The tank has a Fox Face Lo, 5 green Chromis, a tomato clown, and a six line wrasse. There is also 1 yellow tailed damsel that I can't catch to remove. Some hard corals and green star polyps. Multiple snails and hermit crabs. I also have a Blue Linckia and a sea anemone. I have twin bulbs with 65 watts each for lighting. The tank has been running for over a year. I tested the water for Nitrite, nitrates, ammonia and PH and phosphorous. except the nitrate levels had spiked to 20ppm. I did a water change and put some (Prime) nitrate reducer and they seem to be coming down. and my serpent star has these large white patches of what appears to be new or rotting flesh at the area where his legs meet his body. He is still very active and enjoys a good piece of frozen shrimp. Any thoughts? Josh thank-you for your quick response!. I have a media bag with Phosguard soaking in the basin of the sump right now to help remove the phosphate. The nitrate remover i put in the tank was made by Seachem and is labeled (prime). I cant remember what type of anemone he is I got him for 6 bucks at Petco 3 months ago. He doesn't take to the clown fish at all, which I knew ahead of time. I forgot to mention that I also have a green emerald crab in the tank. I did a 15% water change and just checked the nitrates again and they are still at 20ppm. Could this be a bio ball problem? <Yes! Bio Balls without some type of filter sponge before them tend to accumulate massive amounts of detritus which will then rot and contribute to the Nitrate problem. If you don't already have one, you should add one to avoid this problem. Then rinse and agitate the bio balls in a bucket of salt water for a minute or two to get rid of as much detritus as possible. I will monitor the star fish like you suggested. I am a science teacher with a marine touch tank that I have moved home for the summer. It has been 2 weeks and all was well until today when I noticed that the tip of every arm on the serpent star is missing and their is a cut mark near the base of one arm. Last night it was fine. The tank has a false percula, a marine hermit crab which has grown considerably this year, 2 turbo snails, a sea urchin, and a host of amphipods. I have kept an eye on the tank since moving it home, concerned about shock and wondering about the hermit crab and if it is too large to safely keep in this tank. <Setting possible environmental causes (water quality) aside, I am inclined to believe the hermit crab is the likely culprit. Crabs, being scavengers, are never to be trusted completely in a tank. When school resumes, the tank will go back to school and be restocked and I will set up a second tank for this pet crab if needed. Could the hermit crab be the problem, or is something else going on here? Thank you, The touch tank from Wards Scientific hold 25 gallons and the water is testing out within parameters with close to 0 ammonia, nitrates and nitrites and a pH of about 8.3. The creatures (except for the clown fish) were all from a touch tank set from Ward's scientific and have been handled without problem since last October, including the sea urchin. 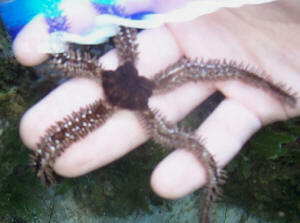 The serpent star has handled being picked up hundreds of times (always kept under water) and eaten well. This is the first time he has had any problems and now has 5 short, stubby arms (pieces kept coming off all day). I will move the hermit crab out into it's own home and see if I can keep everything else healthy for the summer. When I moved the tank I drained the water and kept it, returned it to the tank and let the system clear before reintroducing everyone. Nothing like having the science teacher kill everything during the summer. The high school students I teach have never seen an ocean and this tank means a great deal to them. You can probably guess why we have the clown fish. I had a Cyano problem in my 90 so I dosed Chemi-clean. I had a red serpent star in QT for about a month. I added the star to the 90 along with the Chemi clean. This was about 4 days ago, and now he has all 2-3 inch legs instead of 8 inch legs. The parameters are literally perfect. sized tanks. The QT also has the same parameters. So I'm thinking that the blame should be put on either the Chemi clean, or the 1 large hermit crab in the tank that was apparently picking at it in its first 24 hrs in the tank. The large hermit is about 2 inches across. OR, from something else I did. What are the main causes for this breaking down of the legs? Why do they break down? Etc? 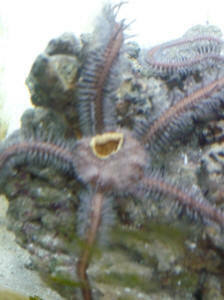 Brittlestar looking odd 3/23/07 Hey Crew, <Hello Marshall. 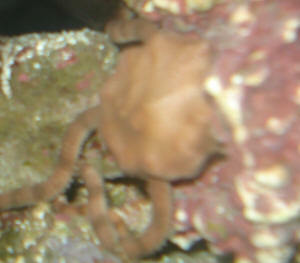 Brandon here tonight.> I have a Brittlestar, specifically the Ophioderma ensiferum. <Interesting creatures.> This morning I observed that his central disc was misshapen, enlarged, and had a couple of protruding bumps. My first thought was that he had consumed something relatively large, but all the inhabitants of the tank are present with the exception of the peppermint shrimp which I didn't see, though he could easily have simply been somewhere unobservable. <Possibly. I don't think that the Star would have eaten it, but then again. Stranger things have happened.> Assuming he hasn't eaten the peppermint shrimp, are there any other explanations for his appearance other than he consumed something? <Could be developing gonads, could be a tumor, could just be moving things around internally. It could have eaten something else that you didn't realize was there.> Would he possibly swallow something other than an organism, i.e. a rock or a shell? <Not likely. These creatures are pretty 'intelligent' about what they eat. They have chemoreceptors about their body that tells them what is food/friend/foe etc.> I apologize for the poor quality of the picture, but you can see the bumps, and his disc has roughly twice as thick as it otherwise is normally. <I would just keep an eye on it, and watch for improvement.> Thanks for the help you guys. Update: Armanddo Stickyfeet: aka green Brittlestar. 9/30/05 <Ah, yes> First, let me thank you for your help. After reading and reworking the one big difference in this tank change was I did not let the water set for 24 hours before adding like I usually do. <Ah ha!> I have a very nice filtration system on the house water, but we had had a few power outages and I don't think it had cycled correctly. Best guess at any rate. Usually I do have water 'at the ready' for tank changes. <Good> My clown fish, and my goby, snail and crabs all still fine. <Very good> Now for Armanddo. Sadly, he lost his arm tips, and is now covered in some kind of stringy stuff. Almost like he's shedding. He finally ate yesterday, and was actually waving his arms a bit, but is now back in 'star at attention' posture. <Good... can recover from horrendous body parts losses> I'm still hanging in there hoping for a full recovery - but the stringy stuff is worrying me. <Not to> New note; I caught some little buggies running to a rock early this a.m. They look like little grey baby shrimp. !?! Could they be torturing my star? <Mmm, not likely... perhaps are helping by feeding on necrotic tissue... akin to the use of insect larvae and leeches in human medicine. Bob Fenner> Thank you again.